Please note that the content of this book primarily consists of articles available from Wikipedia or other free sources online. 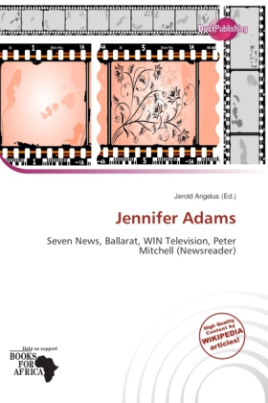 Jennifer Adams (born 1976 in Eltham, Victoria) is an Australian television presenter and producer. After studying at Perth's Curtin University with a degree in journalism, Adams worked at WIN Television Ballarat before joining the Seven Network in Melbourne in 1997. Adams was appointed weekend presenter for Seven News in Melbourne in 2000 after replacing Peter Mitchell who was promoted to weekday presenter, however in 2003 she was replaced by Jennifer Keyte. Adams stayed as a fill-in presenter for Seven News in Melbourne and she also presented updates on weekdays, she has also presented HSV7's local magazine show, Melbourne Weekender and the Nine Network's travel show, Wine Me, Dine Me.